She was right about how quickly radishes grow. For the last month, I’ve been home for summer break. Lunch most days has been salads of radish greens (both red and daikon), tossed with my other early grower, pak choi, and supplemented with dandelion leaves picked from the yard. But now my radish days are coming to an end. They’re crowding out the carrots, and even each other. The other day, I picked one larger than a golf ball! So with an eye to clearing out the last of the radishes, let me run through my favorite ways to use them. Wash the radishes, greens, and dandelion leaves, chop them up, and toss it all together with your favorite dressing. I’ve been too lazy to make my own dressing after picking the salad ingredients, so I’ve been cheating and using Green Goddess dressing from Trader Joe’s. Go ahead and and judge me. This recipe also works well with daikon greens — it’s a great way to use up those young daikons you are thinning out. 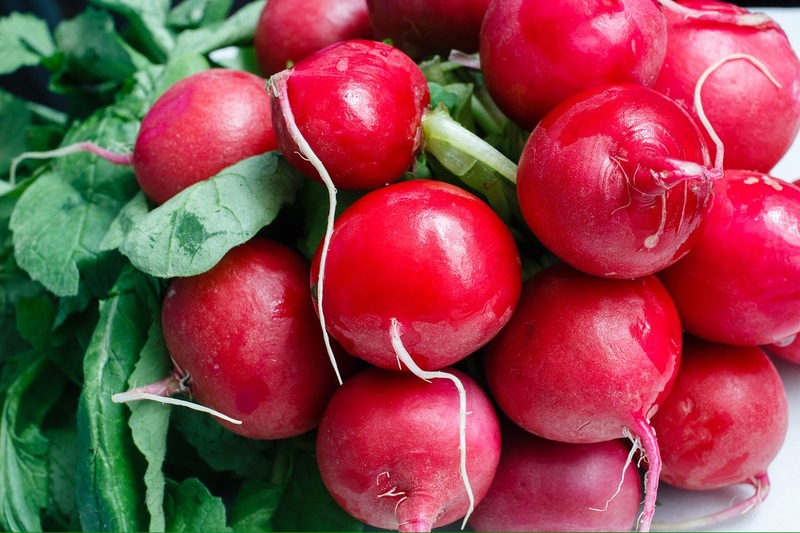 If you want a more radish-centric recipe, Harvest to Table has a delicious recipe for a radish root and leafy green salad that gives the humble red radish center stage. I made the soy-sauce dressing variant and flavored it with shiso from my garden. So good! I also really want to try this radish salad with parmesan and lemon from the Crepes of Wrath. Yesterday’s lunch was a departure — scrambled eggs with sautéed onion, garlic, radish and zucchini. I sautéed the leaves as well as the root, because I like LOTS of vegetables mixed in with my eggs. Radishes are also good tucked into pasta or stir fry. While in California for some training last week, I ordered a dish of roasted vegetables and hummus. To my surprise, there were some roasted radishes tucked into the mix. They were delicious, especially dipped in hummus. Roasting mellows out the spicy radish, giving it a warm, almost sweet flavor. Now I really want to try this roasted radish with brown butter and lemon recipe from Epicurious. I know I’ve only scratched the surface of radish uses. Do you have any favorite radish recipes? They’re delicious cooked under a roast like you would potatoes! My Nannie, (Andy’s great grandmother) used to pickle radishes with onions, a staple in British cooking especially a Ploughman’s Lunch ( from Wales and with the name of Jones….you just gotta….) Big wedge of crusty bread, some pickled onions (small whole white onions) and radish, strong cheese ( like a Weslyan, or sharp Cheddar), Branston relish (Andy loves this) a pint of beer or cider. You can get this at our favorite supplier, The British Pantry, when you come over next we will go down and you can try it. Gives me a chance to get Andy some more Smarties, I’m afraid I am his supplier on those. Everyone in our family loves cheese, and I blame my Dad for getting Andy hooked! They would both sit in their chairs reading their books and chomping on cheese and Saltine Crackers, he is very much like my Dad in some ways, but I think that is a compliment to him. What comes up next Mindy? This is almost like trying to solve a mystery! Any peas? Beans? Potatoes are so easy, place them in the ground keep the soil built up around them and when the green dies dig and get your reward!